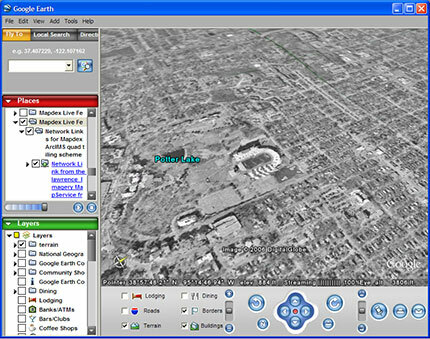 Jeremy Bartley just posted an interesting “hack” to make ArcIMS image services easier to use in Google Earth. The problem has been that by default you were only getting coverage of the GE window, meaning that once you panned even a little bit, you had to wait for a whole new image. Jeremy figured out that if you request 4 images you get coverage beyond the display window allowing you to pan and still see the image. Of course it still isn’t perfect, but in his quad implementation, I actually didn’t mind an ArcIMS image service in Google Earth for practically the first time. Go over to his blog and check out the two network links, one with the quad tiling and the normal one image link. I’m impressed!